My daughter, Ronda Reynolds, 33, was discovered dead of a gunshot wound to her head, in Toledo, Washington, on December 16, 1998. She died on the floor of her master bedroom walk-in closet, following a heated argument with her husband. The scene was contaminated by the Lewis County Sheriff’s Department before the lead detective, Jerry Berry, ever got there. 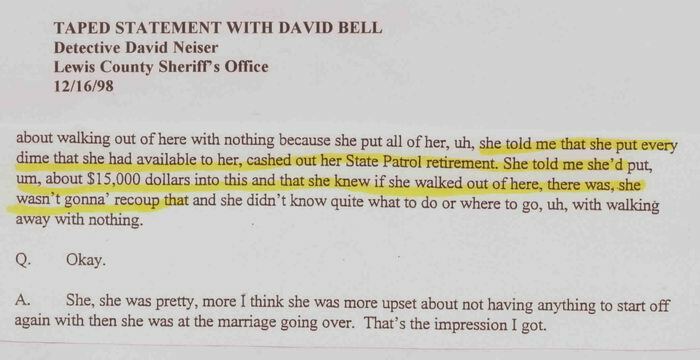 Several months later, as Detective Berry was in the process of pursuing answers to a long list of inconsistencies, Ronda’s husband hired an attorney, who threatened to sue the sheriff’s office for not following proper procedures. 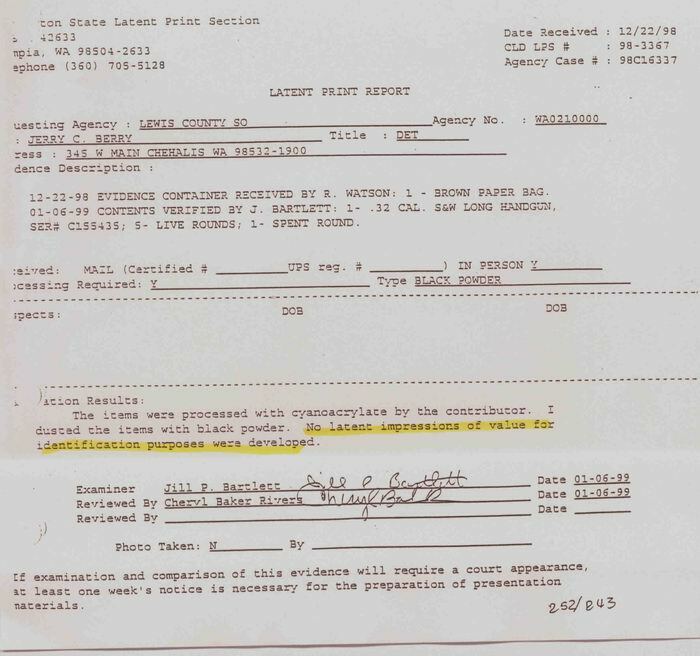 Sheriff John McCroskey responded by closing the case as a suicide one week later, using as justification a falsified report by his detective, Sgt. Glade Austin. Ronda had been married for eleven months to Ron Reynolds, principal of Toledo Elementary School. Their marriage was rocky from the start and reached a crisis point in Oct., 1998, when Ronda discovered that Ron was having an affair with his ex-wife. Ron wanted out of the marriage, and Ronda did also, but she wouldn’t agree to Ron’s demand that she relinquish the $15,000 of her personal savings that she had invested in their new home. Ron’s statements to law enforcement were so unbelievable that it seems impossible that nobody thought to question them. Ron told police that Ronda phoned him at work on the afternoon of December. 15, threatening to kill herself, and he raced home to prevent her from committing suicide. Yet David Bell, (a former sweetheart, who had remained a close friend and confidante), spent part of the evening of Dec.15 helping Ronda pack and move her things out. David, a 20 year veteran police sergeant, who was with Ronda when she phoned Ron, reported the conversation was unemotional and business-like, centering upon details of the separation and various courses of action available. 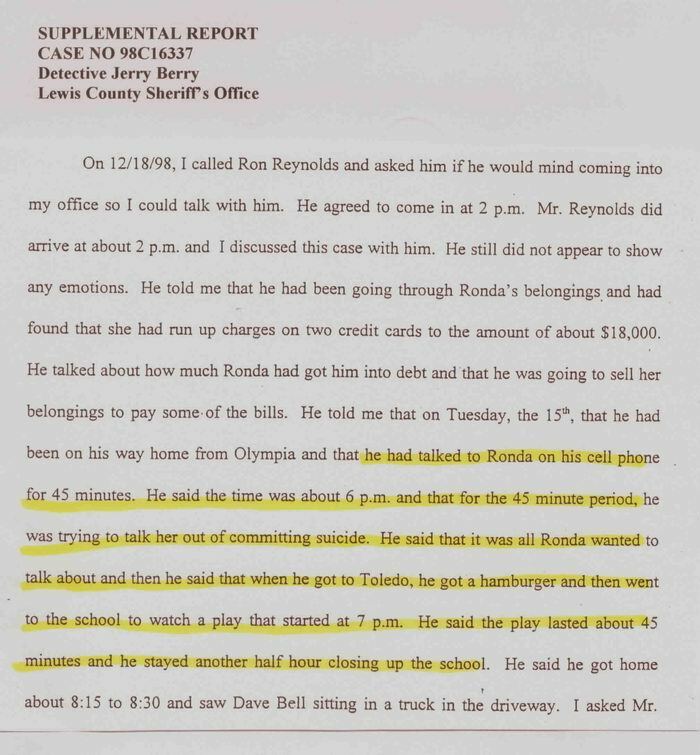 And, contrary to what Ron told police, he did not “race home” – instead, he went out to dinner and attended a play at his school. Later, when I asked him why he didn’t call 911 if was worried that Ronda was suicidal, he said, “I figured if she didn’t do it then, she would only do it later, so I got a hamburger and went to the play.” And stayed and helped clean up afterward. That evening, Ronda phoned to tell me that her marriage was over, and she was coming to visit me in eastern Washington, where she would sort things out and form a game plan. She had made plane reservations for the next day, and David Bell would take her to the airport. When deputies arrived at the house, they found her bags and makeup kit packed and ready to go and a phonebook open to airline listings. In our phone conversation, Ronda showed no signs of depression. Instead, she seemed eager to get on with her life and her relationship with David. She told me that she was going to demand her money out of the house, and if Ron didn’t agree, she would fight the divorce and demand half of his retirement. 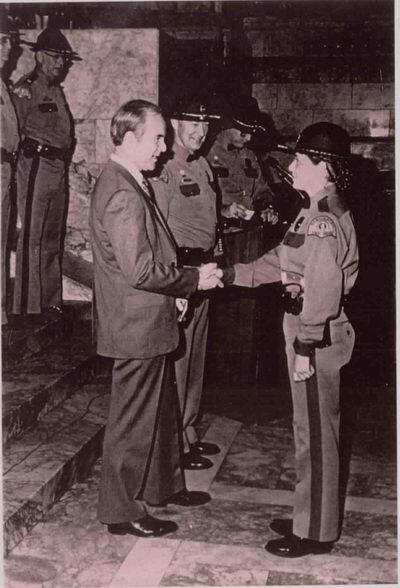 Ronda was a former Washington State Trooper, and if people tried to walk on her, she became a tiger. 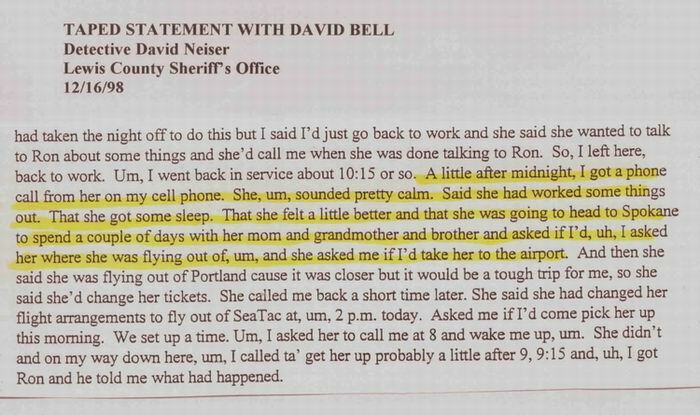 David Bell was with Ronda until 8:30 that evening, and he talked with her again by phone at about 12:40 a.m. to confirm the time of her flight. He reports that she was in good spirits. Yet, Ron contends that Ronda spent the entire afternoon and evening threatening to kill herself. Ron’s story is that he stayed up with Ronda until 5 a.m., trying to talk her out of suicide, and then fell asleep with her beside him. (Yet, investigators noted that only Ron’s side of the bed had been slept in.) Ron asserts that he was awakened by his alarm clock at 6 a.m., discovered that Ronda wasn’t next to him, and searched the house before finally finding her in the closet with the door closed on an electrical cord going to the bathroom. (Ronda’s body was sticking half out of the closet, making it impossible for the door to have been closed.) 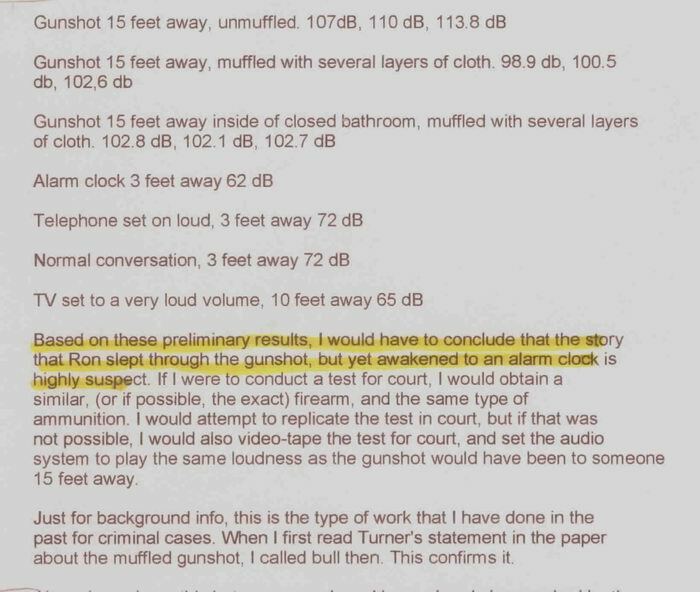 And, although he is a light sleeper, Ron, who was less than 15 feet away, allegedly never heard the gunshot. Nothing about the death scene indicates a suicide. Ronda died from a gunshot wound below her right ear and, according to medical reports, died instantly. 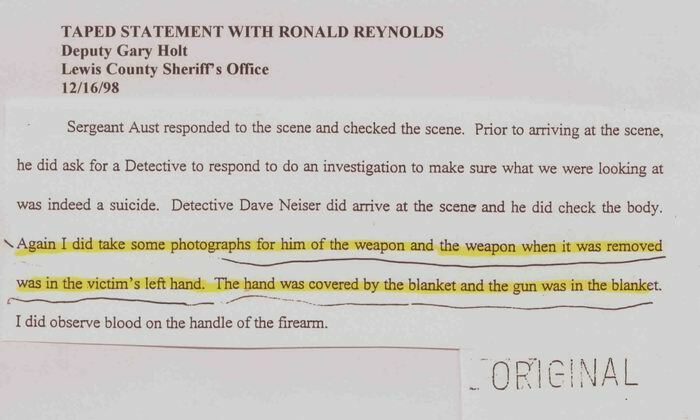 Yet she was found with a both hands under a blanket and Ron’s handgun on top of that blanket near her left hand. 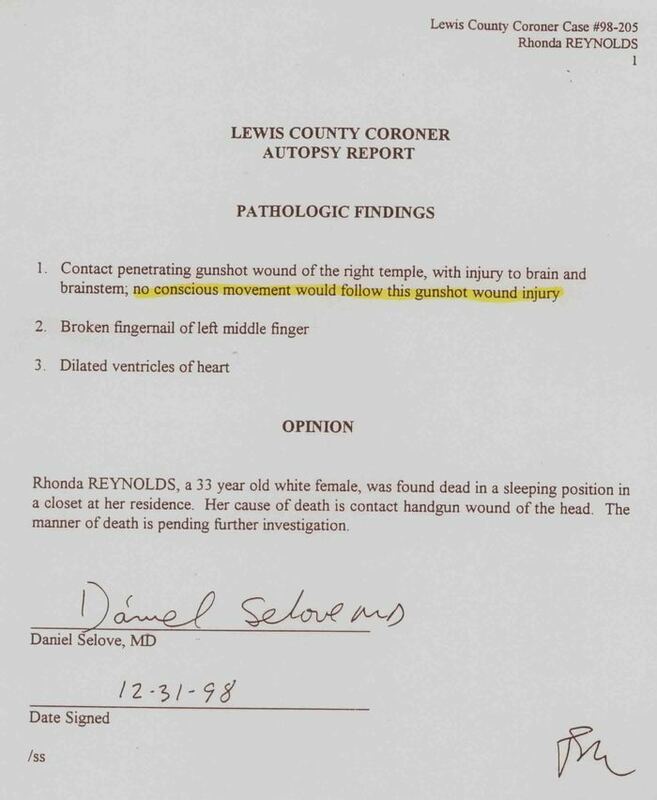 Forensic experts and reconstruction of the crime scene indicate that it would have been impossible for Ronda to have used her left hand to shoot herself on the right side of her head. Besides that, Ronda was right-handed. Ron, however, is left-handed. Independent experts retained by the sheriff’s department while Detective Berry was on the case, found that fact highly significant, because a left-handed person trying to stage a crime scene might automatically place a weapon near the victim’s left hand. There were no fingerprints on the gun. Someone had apparently wiped it clean. The idea that Ronda would wrap herself in an electric blanket and turn it on is inconceivable. She had a fear of electric blankets and never used one. 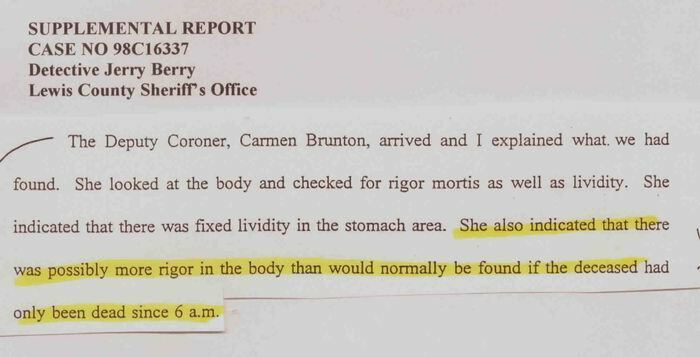 Apparently her killer erroneously assumed, as many people do, that heat delays rigor mortis. The truth is just the opposite – heat tends to speed up rigor mortis and lividity. 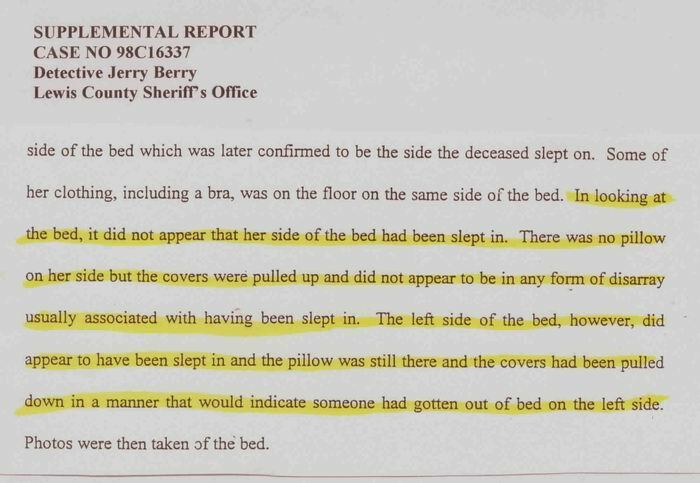 But, even taking into consideration the acceleration caused by the electric blanket, it was still apparent that more rigor and lividity had set in than could be accounted for if Ronda died at the time Ron said she did. 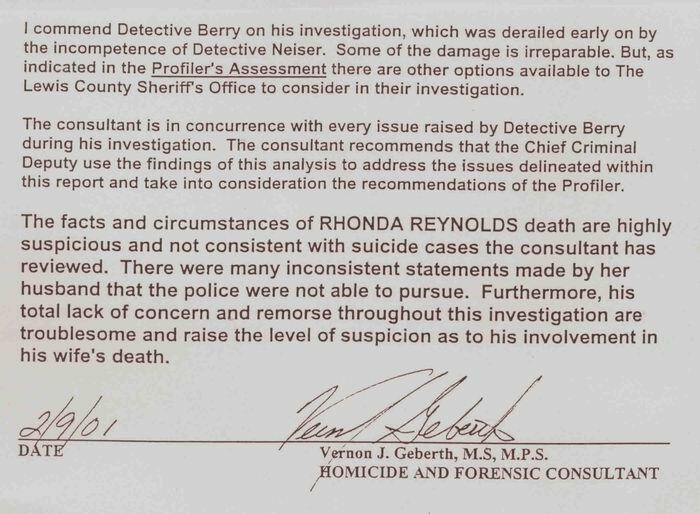 Experts tell us that the time of death might have been as early as 1:30 or 2 a.m.
At 6:20 a.m., Ron called 911, and in a recorded phone conversation told the operator, "My wife committed suicide." The operator asked if he had taken her pulse, and Ron said no. He left the phone and returned to report that there was no pulse. 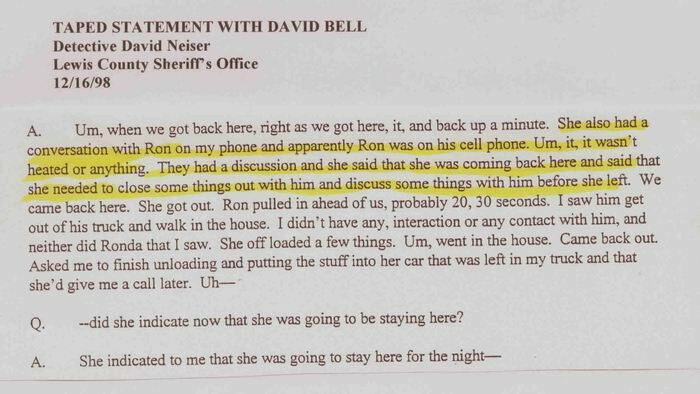 Yet, when questioned by the first deputy to arrive at the scene, Ron stated that he took Ronda’s pulse before phoning 911. There were well over 20 such inconsistencies in Ron’s statements, and he personally admitted to me that he failed his first lie detector test. The first deputies and detective at the scene totally blew the initial steps of the investigation. 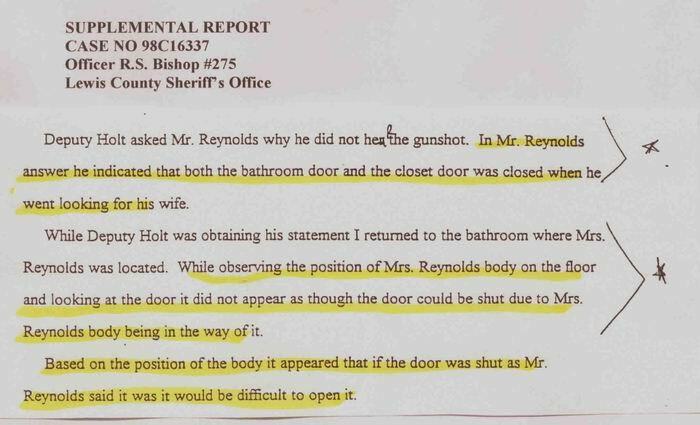 They didn’t secure the scene; didn’t perform gunpowder residue tests on Ron Reynolds; and let witnesses (Ron’s three sons, ages 17, 15, and 10, whose bedrooms were less than 20 feet from where Ronda was shot), leave the scene without questioning them. The oldest of those boys had once threatened Ronda’s life and been forced to take anger management classes. Gunpowder residue tests were not performed on him either. 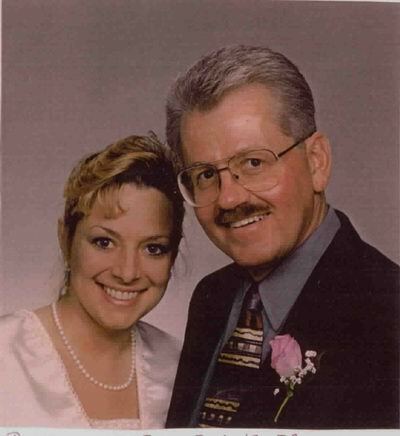 Between May, 1999, when Ronda’s case was first closed as a suicide, and June, 2001, when Detective Berry quit the department, Berry continued to develop new evidence in an effort to get the case reopened. 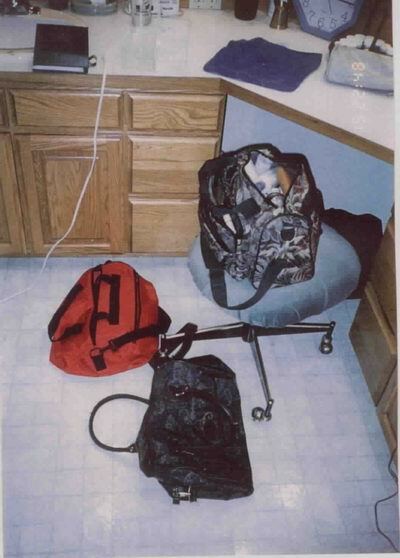 Much of the evidence collected has since been discarded, returned or destroyed by the sheriff’s department, and very important crime scene photos have mysteriously disappeared. 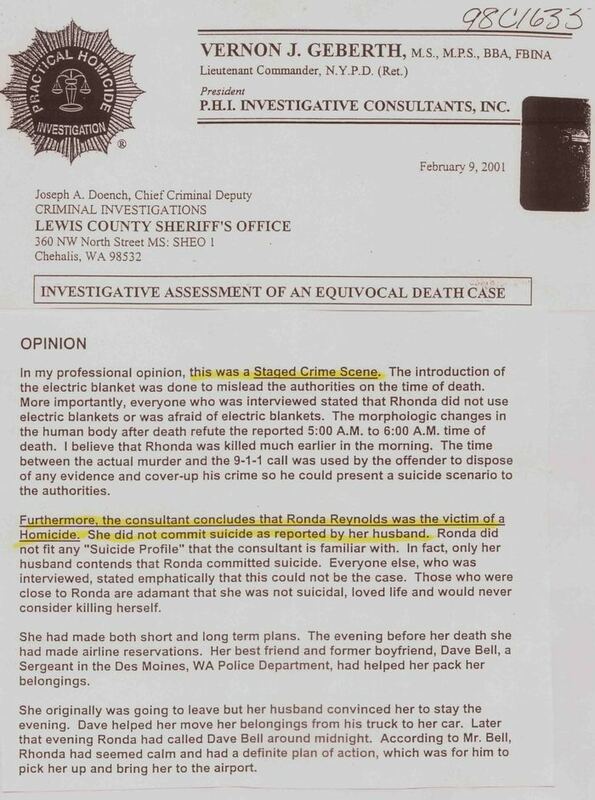 In Oct., 2001, at my insistence, the assistant coroner requested that the State Department of Health’s Vital Records Division change the manner of death on Ronda’s death certificate from “suicide” to “undetermined.” But, despite that reclassification, all the new evidence, and the findings of outside experts, Sheriff McCroskey again closed the case as a suicide, without a shred of evidence to support that decision. The assistant coroner, who was at the scene, has admitted to me that she believes my daughter was murdered, but she has been directed not to discuss her views on the case. On the night of the day Ronda died, Ron’s ex-wife was back sleeping with Ron in my daughter’s bed. I was there the following morning, and Ron spent 30 minutes telling me what a horrible person Ronda was and listing all the reasons she deserved to be dead. He was also furious because she hadn’t paid her life insurance premium, and he’d had to rush a premium check into the mail so it would be postmarked on Dec.16th. He told me he didn't care what I did with Ronda’s body as long as he didn't have to pay for it. I chose to have her cremated. I could get on with my life if Ronda had been killed in an accident. I could even have accepted suicide, if it truly was suicide. But having to deal every day with a police cover-up – reading and rereading the case file, finding investigative mistakes and reading the blatant lies that have been manufactured to conceal those blunders, keeps the wound of my loss open with no chance of healing. To live without closure is unbearable. To let a politically corrupt law enforcement agency lie, cover up, and disregard a human life to benefit their self-image is unacceptable. The Lewis County Sheriff’s Department and all other law enforcement agencies in our country need to be held accountable for their actions, so that no other parent, ever, will have to experience this type of indescribable nightmare. 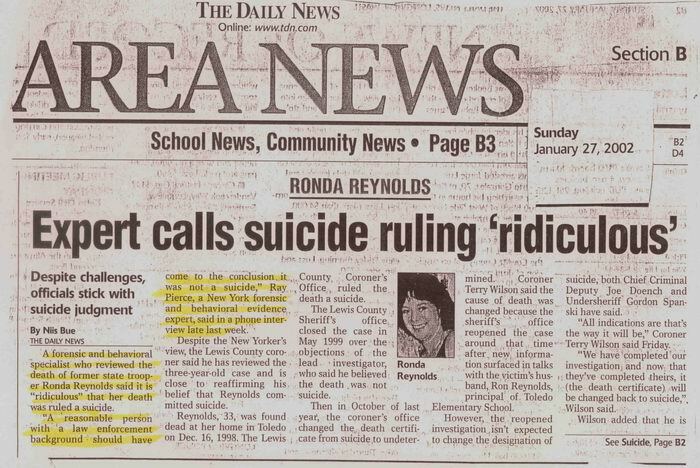 January 8, 2010: After a jury's unanimous decision that Lewis County coroner, Terry Wilson, was wrong in his ruling of suicide in the Ronda Reynolds case, Thurston County Superior Court Judge Richard Hicks ruled that Wilson must change that ruling.